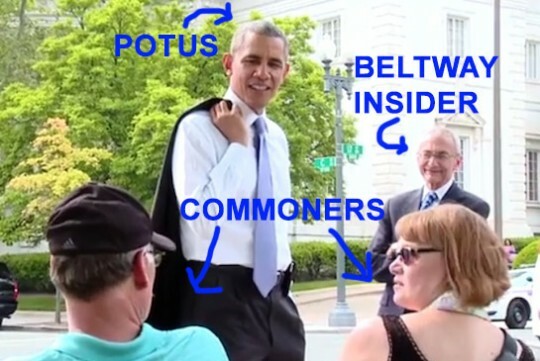 President Obama went for a walk last week, and even mingled with some commoners beyond the White House walls. The "surprise" occasion was (shockingly) captured on camera and widely disseminated; the White House posted the "raw video" here. Most of the commoners were thrilled to encounter the president walking amongst them. One woman was "so excited," and remarked that it was "like the best day of my life." One bro fist pumped while yelling: "America! Freedom! Peace! Hope! And charity! [sic]"
But not everyone was so impressed. At the 2:41 mark, you can see some disgruntled workers who are unable to get in their cars and drive home due to Obama’s security entourage. And at 0:40 we see a couple that couldn’t even be bothered to stand to greet the president. This entry was posted in Culture and tagged Barack Obama, White House. Bookmark the permalink.